By now you probably either invest in closed-end funds (CEFs) or have heard more folks talking about them. There’s a good reason why: dividends! With 10-Year Treasuries yielding around 2.6% and your typical S&P 500 stock paying even less—just 1.9%—there’s a very good chance none of the folks you know are clocking dividends that can even beat inflation, let alone provide a decent income stream! So when an investment comes along throwing off yields of 7%, 9% … even 11%, people take notice. In a moment, I’ll show you exactly why these outsized yields exist—and how to grab a slice of this cash for yourself. But before you start shopping for a closed-end fund, you need to know the difference between them and their “open-end” cousins. Open-end funds encompass all the mutual funds and exchange-traded funds you probably know well. There’s a reason why folks are drawn to them—they’re simple investments. Here’s how they work: let’s say an open-end fund has $1 million of assets and 5 million shares outstanding. That means each share is worth $0.20. Now let’s say a new investor wants to throw another $100,000 into the fund. The fund will simply create 500,000 new shares and sell them to that investor. Now the fund is worth $1,100,000, and each share in the fund is still worth $0.20. Since new money doesn’t impact the value of an open-end fund’s current investments, the fund can theoretically take in an infinite number of new investors and issue an infinite number of new shares without affecting the value of previously invested capital. At this point, you may be wondering how the price of an open-end fund rises and falls. It’s because the fund’s price is tied directly to daily changes in its net asset value (NAV, or the value of the assets in its portfolio). That’s a different—and far less profitable—setup than you get with closed-end funds, which we’ll explore next. A closed-end fund is closed in one specific way: it cannot issue shares to new investors. With few exceptions, CEFs start with a set number of shares at their IPOs—and that number stays the same for the fund’s entire life. Those shares trade on the stock exchange throughout the day. That means shares of CEFs are much more dialed in to market demand. It also means there can be a big disconnect between the NAV and a CEF’s share price. Stick with me for just a moment more, because here’s where our opportunity lies—including our shot at big, safe dividends. Here’s how it all comes together: as before, let’s say a closed-end fund has $1 million in assets and 5 million shares. That means the fund starts the same way as the open-end fund does, with each share worth $0.20. Now let’s say an investor wants to put $100,000 into the fund. However, the CEF can’t create new shares, so the fund’s management can’t accept the cash. Instead, the CEF’s shareholders need to sell their portion of the million dollars in NAV to the new investor. Already you can see a pretty big difference between open-end and closed-end funds. With CEFs, management has a lot less power; instead, shareholders have a lot more power over whether to allow new capital into the fund or not. Because let’s say no one wants to sell to the new investor. In that case, the new investor needs to create an incentive to get those shareholders to sell. They won’t sell $0.20 of assets for $0.20? Okay—what if the investor offers $0.21 for every $0.20 of assets? Shareholder #1 sells $20,000 at $0.25 per share. Shareholder #2 sells $50,000 at $0.27 per share. Shareholder #3 sells $30,000 at $0.32 per share. After these transactions are completed, the new market price for the CEF is $0.32 per share—even though the NAV is still $0.20! In other words, the CEF is trading at a 60% premium to its NAV. At the same time, the total number of shares in the fund has remained constant. Keep in mind that the opposite can happen—and it does all the time. Investors can be eager to sell their shares, causing the price to go below its NAV, thus causing the CEF to trade at a discount. Because of the CEF structure, many of these funds trade at a very large discount to their net asset value. This gives us the opportunity to buy many high-quality investments at a discount. Some of these funds effectively sell shares in companies like Apple (AAPL), Berkshire Hathaway (BRK-A, BRK-B), Microsoft (MSFT) and Wal-Mart (WMT) at prices lower than their market price. It’s not uncommon for CEF investors to buy $1.00 worth of high-quality firms for $0.90 or less. It’s a perfect scenario for the overpriced market we’re experiencing now! As I mentioned earlier, a major benefit of CEFs is that they pass through the majority of their capital gains and investment income in the form of cash dividends. This means many CEFs offer dividend yields of 7% and higher—some will even yield as much as 11% or more—while the most extreme can offer 19% yields! On top of that, CEFs can easily sustain those high yields because they often trade at a discount to their net asset value. For instance, if a fund is trading at a 10% discount (and many funds regularly do) and it yields 8%, that means the fund managers only need to get a 7.2% income stream to sustain those dividends for investors. This is what makes CEFs particularly attractive to income seekers. As I write, there are over 500 closed-end funds managed by many professional managers, including some of the world’s largest fund companies, such as BlackRock. In all, CEFs have around $300 billion in assets under management and invest in many different things, such as real estate investment trusts (REITs) corporate bonds, municipal bonds, US stocks and foreign investments. That makes it a cinch to “trade in” your current stocks and funds for these income machines. 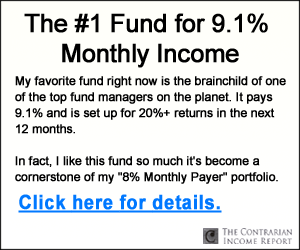 Thanks to their high yields, it’s possible to get a sustainable $3,300 monthly income stream from just a $500,000 investment in CEFs, so it’s no wonder these funds have grabbed a lot of attention from retirees and other folks looking for a passive income stream. If you’re interested in buying assets at a discount, getting access to the largest asset-management companies in the world, and a very large dividend stream that’s more than three times greater than you’d get from most mutual funds, then yes, CEFs are absolutely for you. You can buy and sell a closed-end fund during normal trading hours, just like stocks. You can buy them through any retail brokerage, such as Fidelity, eTrade and Scottrade. Commissions and fees are not higher for CEFs than for normal stocks. Here’s the best news: I’ve done all the research necessary to uncover the best high-yield CEFs out there—so you don’t have to. The result is a FREE Special Report unlike any we’ve published before. In its pages you’ll find the 4 CEFs I’ve handpicked for strong growth and high—and growing—dividends in the years ahead. If you want to build a portfolio that can keep your retirement income safe—and growing—when the next crash hits, holding at least one or two of these 4 funds is an absolute must. Life-Changing Dividends: The 4 CEFs in my new Special Report boast 7.5% CASH payouts, on average—4 TIMES MORE than your typical S&P 500 stock. AND one of these off-the-radar picks even throws off an incredible—and safe—8.4% payout! BIG Upside: All 4 of these low-key funds have been completely ignored as the herd stampedes into the big names in the CEF world. That’s left them trading at ridiculous discounts to NAV. But that won’t last. When these weird markdowns snap shut, they’ll catapult us to 20%+ price gains! Don’t wait. 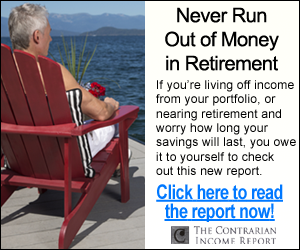 CLICK HERE and I’ll share the names, tickers, buy-up-to prices and my complete research on all 4 of these retirement lifesavers.